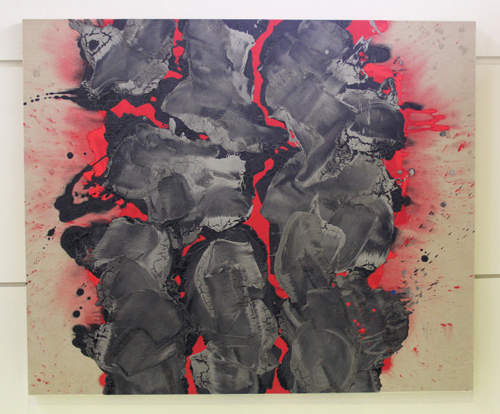 The paintings "Blink" by Charles Arnoldi and "Red + Black" and "Skowhegen" by Ed Moses are displayed on the second floor of Cerritos City Hall. The paintings were donated to the City of Cerritos' Artwork in Public Places program on August 8, 2013 by McKenna Volkswagen of Cerritos Auto Square. Arnoldi is a prominent Southern California artist and is known for creating brightly colored abstract paintings that incorporate the use of wood. He was born in Dayton, Ohio, in 1946 and came to California after graduating from high school. He attended Ventura Junior College and Chouinard Art Institute. His work has been exhibited extensively and has been collected by numerous museums, including the Art Institute of Chicago; Guggenheim, Bilbao, Spain; Los Angeles County Museum of Art; the Metropolitan Museum of Art; Museum of Modern Art;	and the Smithsonian American Art Museum. Moses is also a prominent Southern California artist and his work has been exhibited since 1949. He was born in Long Beach in 1926 and he holds bachelor of arts and master of arts degrees from the University of California, Los Angeles (UCLA). He has taught at UCLA; California State University, Long Beach; California State University, Bakersfield; and Skowhegan School of Painting and Sculpture. 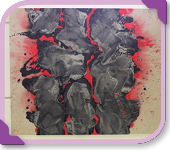 His artwork has been exhibited internationally, and his pieces are included in the collections of numerous museums, including the Art Institute of Chicago, The Corcoran Gallery of Art, Los Angeles County Museum of Art, the Museum of Modern Art, the Philadelphia Museum of Art and the Whitney Museum of American Art.